The following Minute was approved at the February 2004 Durham, Maine, Friends Monthly Meeting. The Minute is a result of hours of prayer, discussion, listening, reading, open meetings, etc. 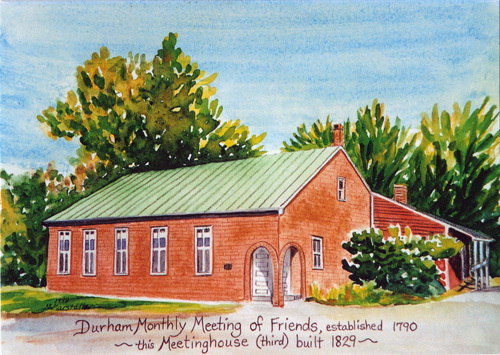 As a Faith Community, we at Durham Friends Meeting embrace the teachings and action reflected in the life of Jesus Christ. As a community that seeks to follow the leadings of the Inward Christ, the spirit of God, we look for that of God in every person. We celebrate and are enriched by diversity. Therefore we welcome as equals all who feel called to join with us regardless of sexual orientation. We are called to a love that goes beyond outer differences in race, nationality, gender, age, sexual orientation and personal belief. It is a love that unites us as one with no separation to the Eternal Spirit of God. “Friends have always held that the sacred nature of a sexual relationship is affirmed only in marriage. In recent times, however, some Friends have found such affirmation in other contexts. Let us be certain, in any case, that we hold up to the Light any sexual relationship we may be considering and reject any relationship that may violate the integrity or spiritual welfare of either of the partners or of others.” We unite in our support of all who have made such sincere commitments to each other. Note: The quotation in paragraph three is from Faith and Practice of New England Yearly Meeting of Friends, 1985. It is found in the section on Advices, p. 207, concerning Personal Conduct.